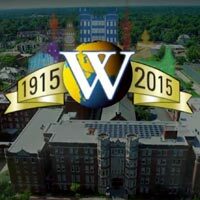 Nine Network's "Webster University: 100 Years"
The Nine Network documentary "Webster University: 100 Years," which aired on the St. Louis PBS affiliate in September and October, is now viewable on the Nine Network website. Produced by Nine Network's Patrick Murphy, himself a Webster alumnus and Webster Groves resident, the film traces the University's community impact through the decades leading up to the centennial, and highlights the vision for its second century. The film includes rarely seen archival footage and interviews with Webster leaders, Sisters of Loretto, historians and community members who witnessed Webster's transformation. View a trailer for the film below and watch the full 26-minute documentary at the Nine Network website.